Made By Coopers is a brand that I came across a long while ago in a subscription box (thanks for the intro to such a lovely brand Pink Parcel! ), and today I am finally going to be sharing my thoughts on their beauty and wellbeing treatments! 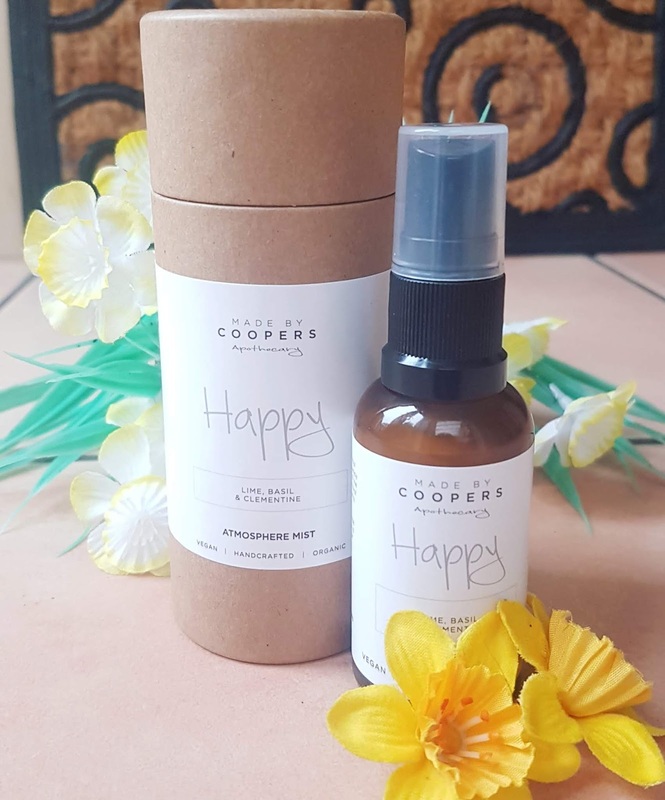 Described as a "a modern apothecary crafting natural and organic products for your skin and soul," Made By Coopers offers a variety of green goodies, including serums, cleansing oils, home fragrance, scrubs, bath salts, and more. Each of their formulas has a specific aromatherapy benefit, whether it is a candle designed to increase positive feelings or a facial oil that calms you before bed. 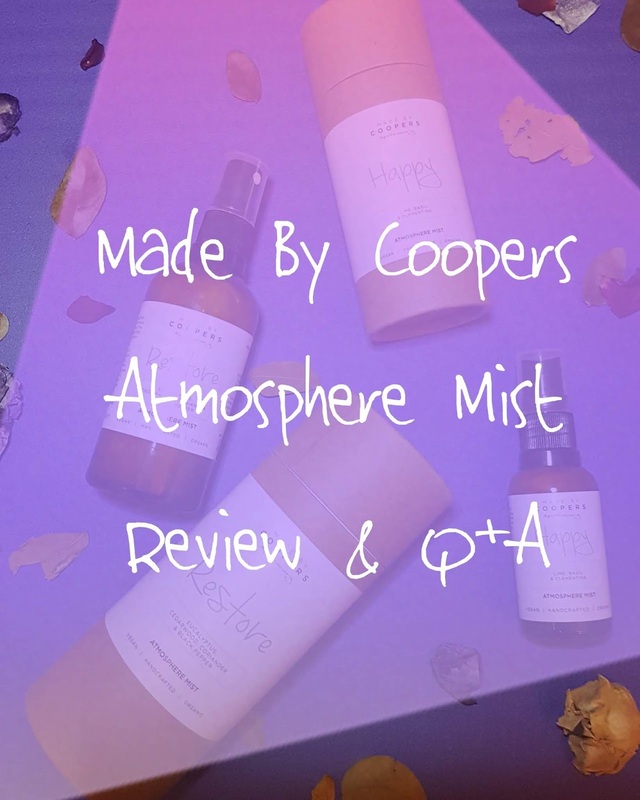 You all know how much I appreciate products that boost both the health of your skin and your spirit, so when I was given the opportunity to review a few of Made By Coopers' home fragrances, I was super excited to give them a go and write up my thoughts for all you eco-beauties. Made By Coopers offers two types of home fragrance -- the Aromatherapy Soy Candle and the Atmosphere Mist. With six main 'mood' varieties and two additional sprays, the brand has a great selection available which is great for those searching for a specific aromatherapy blend. 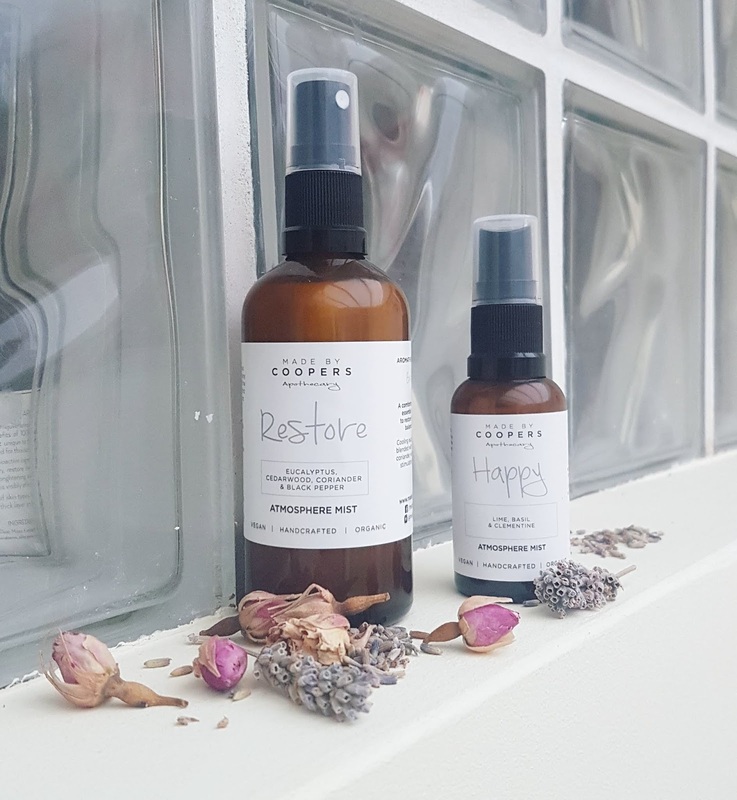 The range includes Calm, Restore, Happy, Invigorate, Revive, and Awake, plus a Sleepy Head pillow spray and a special bespoke collaboration blend for meditation with Hotpod Yoga. Best thing about them all? Each is made with 100% therapeutic grade essential oils -- no nasty synthetic fragrances found here! I was gifted two of the Atmosphere Mists: a travel friendly 30ml size of Happy, and a full 100ml size of Restore. Both come in a sturdy cardboard cylinder that helps protect the glass bottle in transit, and I like that the full instructions and ingredients are listed on the bottle's label as well as the outer packaging. For me, there is nothing more annoying than when the ingredients and usage guide are not easily accessible, so Made By Coopers definitely gets my approval on that aspect. One of my favourite things about the Atmosphere Mist products (other than the amazing aroma of course) is how evenly they spray. I really get frustrated when a spray nozzle shoots out like a jet or is difficult to control, but I found Made By Coopers' home fragrance blends had a fine and light spritz -- perfect! I also was really pleased by the glass bottles, clear descriptions, and how fragrant each blend was. You only need a few pumps to fill a room with the beautiful scent, so even the mini bottle lasted me ages! I actually have tried Happy before (again, thanks Pink Parcel!) and found it amazingly fresh. The scent of lime, basil, and clementine is uplifting and energizing, and the whole blend is like positivity in a bottle. I have found the fruity aroma is a great mood boost during these cold, drizzly, grey winter months, as it helps bring a bit of sunshine to the room even if it is an icy mess outside. The essential oils are "designed to exhilarate and excite, leaving you in a state of happiness," and I have to say that it does just that. You can't help but feel instantly lifted after breathing in this blend. Happy has actually been such a hit with me it even made an appearance in my Best of 2018 post for Home + Hygiene! It's just such a delight to use when you're feeling low, or if you sense you need a little pick me up. Restore is a much warmer scent than Happy, and it provides a more balanced and comforting atmosphere to the room. With eucalyptus, black pepper, cedarwood, and coriander, this room spray helps bring peace during times of stress or chaos. We found this especially helpful during the craziness of the holidays, but it is also the perfect way to wind down at the end of the work day. I like to give the living room a few pumps as soon as I am done with my PhD work (or blogging, or whatever work I got up to that day!) as it signals it's time to just chill. No worrying about what needs to get done until the next morning -- with just a few quick spritzes your emotions begin to settle and your mind can let go of any lingering anxieties. I have also found that Restore is great for settling my mind before bed if my ADHD brain won't shut off. Instead of lying awake for ages just thinking about everything and anything, I can just relax into sleep. I just spray my blanket that I cozy up with downstairs and let the aroma wash over me in the hours leading up to bedtime -- it's as easy as that! If I'm totally honest, I do think that the cardboard canisters are not entirely necessary. Personally, I would be happy to just have the bottle to save on materials, but that being said I am really happy that there is not any additional plastic used for packaging! 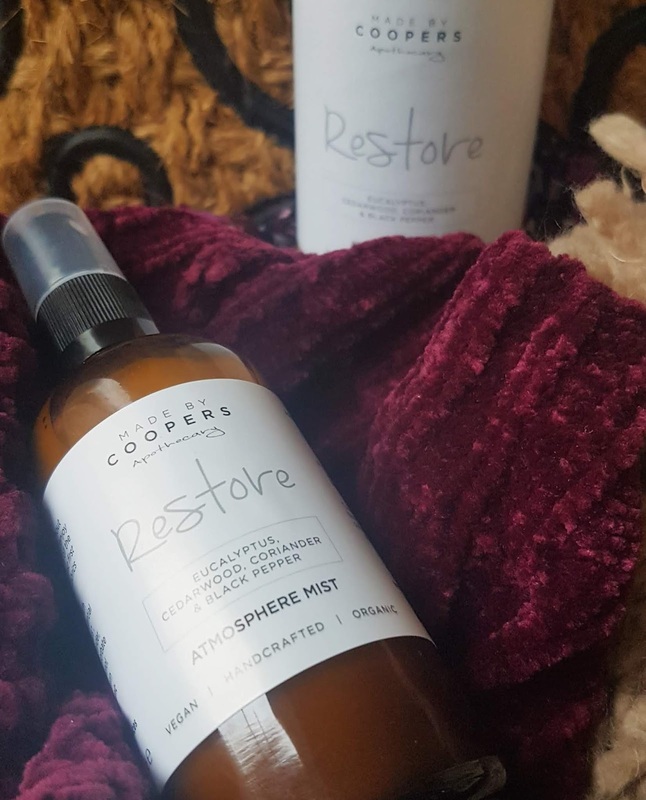 Made By Coopers' Atmosphere Mist has proven to be a fab asset in our home as they are so potent and full in scent. While they do contain my enemy phenoxyethonal, I was okay with this ingredient making an appearance as the spray does not have any contact with skin. As the fragrance lingers and continues to work long after your initial spritz, I have to say these have won a spot in my permanent home fragrance collection. Overall I have been loving both blends since they arrived, and now that I have had a more thorough browse of Made By Coopers' skincare products, I think I will need to pick up a few goodies when my stash runs down and see if they get on with my semi-sensitive and congestion prone skin. I am especially interested in trying out their Luna Goddess Night Serum, as it sounds like the perfect pre-bed treat! Well, I have shared my thoughts on the Atmosphere Mist blends I was gifted, but now I think it is time we get to know one of the minds behind the brand -- Clare! How do you approach beauty and wellbeing? I try and be as natural as possible in what I put on my skin as well as the food myself and family eat. I make sure I get some time out doors most days for my emotional wellbeing, especially as we have relocated to the beach. If I've had my head in the computer all day and my brain feels a little scrambled, it can be so calming to see the sea and unwind. What inspires you in your creations? I am inspired by the way I'm feeling and what I'm doing. If I've been meditating a lot, frankincense usually ends up in new creations, as I use it for meditation! If I'm needing a mood boost, I create products that help elevate moods and energise! What product from your range do you find yourself using most often? Right now, Grapefruit Passion cleansing oil (every night), Rose Divine face mist and Restore atmosphere mist. Our Sleepy Head pillow mist gets sprayed every night too! Are there any upcoming launches or surprises we can look forward to in 2019? 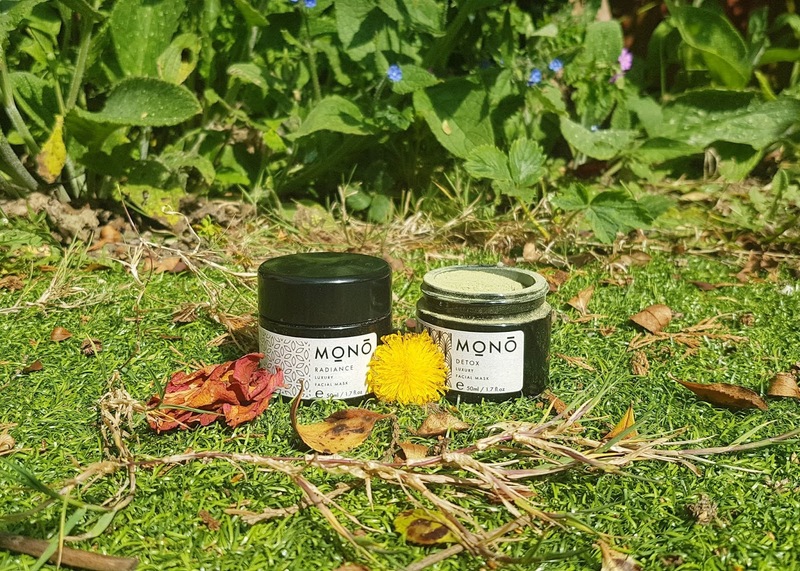 We have lots of ideas but have just launched the clean beauty facial range back in November, so may add some extra pieces on to that, such as clay masks. I'm a firm believer in supporting others in the field you work in, whether that is academia, marketing, blogging, beauty... Are there any small businesses you want to give a shout out to or express your support for? Yes, I'm always meeting like minded women and men at events so would love to mention Nini Organics, Lena Wild, The Real Stuff, Hemsley Organic and Butter Bar Soapery. A huge thank you to Clare for taking the time to answer my questions -- I loved reading your responses and it was interesting to see we both gravitated towards Restore at the moment! 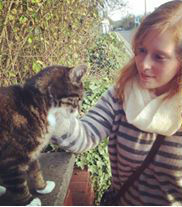 And I hope that all you eco-beauties enjoyed getting to know Clare too -- if there are any other questions you would love to have answered, do let me know! Or, if you would like to see more Q&A style interviews incorporated into my reviews give me a heads up. I really enjoy getting to know the founders of stand out brands and hearing their thoughts on both their products and wellbeing in general, as it helps me feel more connected to the products. Do you feel the same? Have you tried Made By Coopers yet? What did you think? And did you pick up products based on their aromatherapy benefits or skincare goals?? I feel like I'm playing twenty questions, but I am genuinely curious to learn what you think -- so let me know in the comments below!